What a great surprise it’s been to land in Kentucky for a few nights. 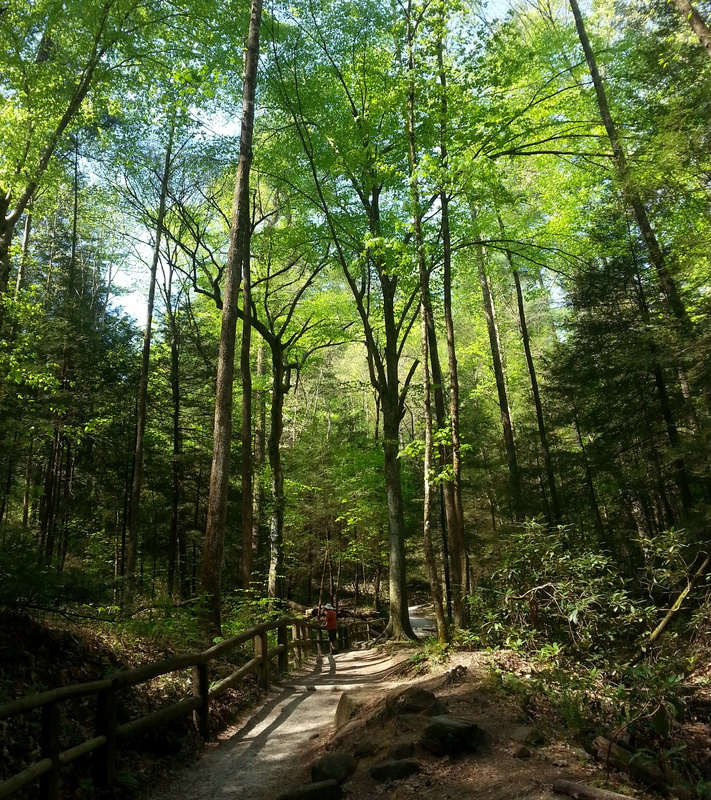 So much greener already than North Carolina was – probably because we’re at 650 feet here, and Raccoon Holler was about 3200 feet. 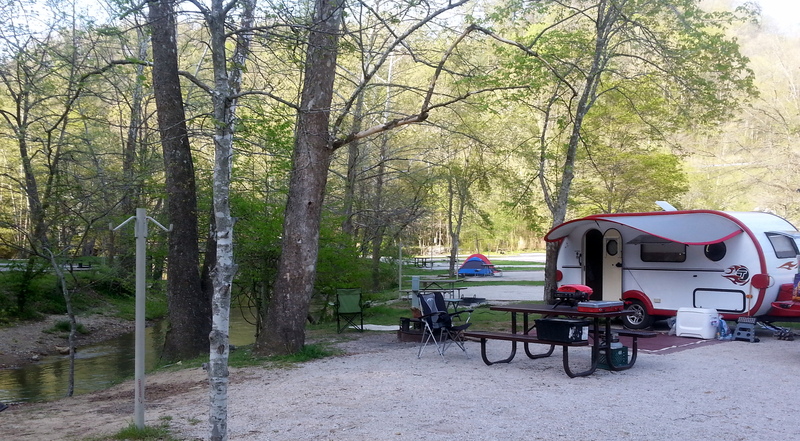 Our lawn chairs are parked right on the bubbling river, and the birds are plentiful and loud. 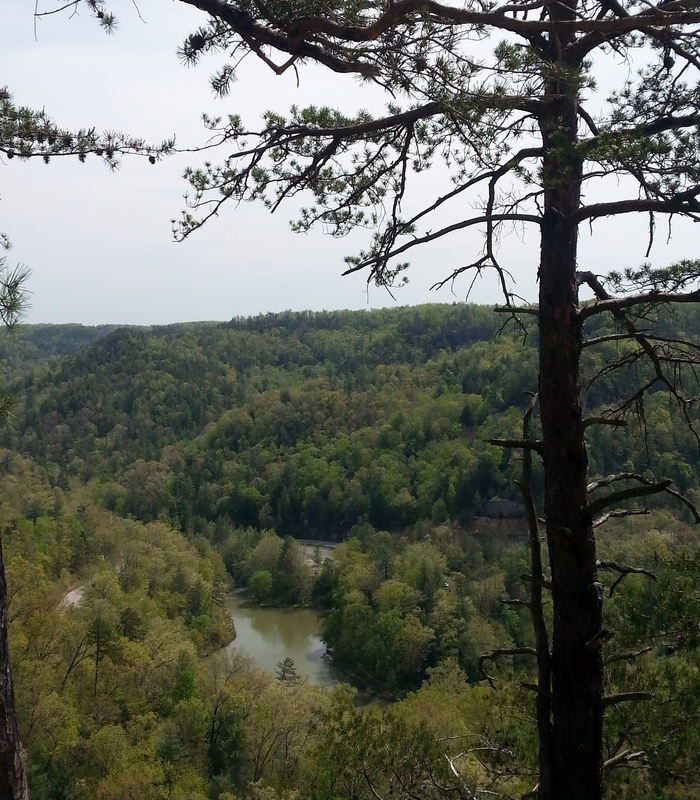 So we hiked off to see the big attraction here at Natural Bridge State Park, but my expectations for spectacular scenery were low. 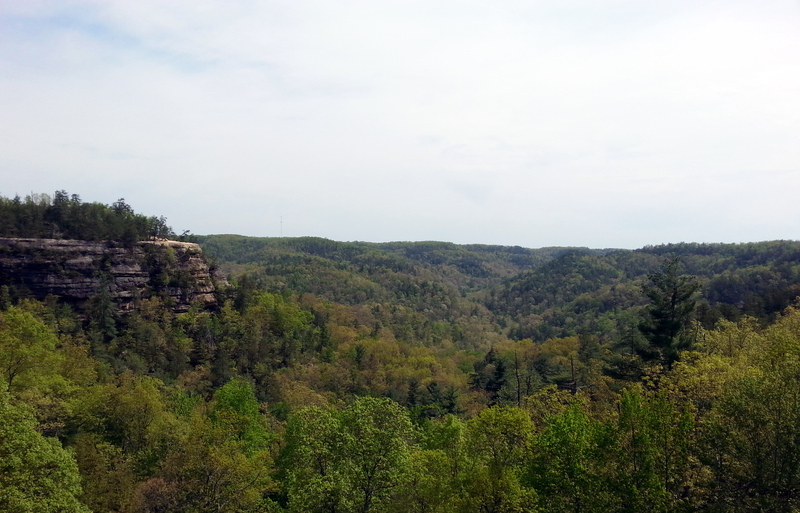 I know it’s wrong to compare Kentucky arches to Arches National Park, but I can’t help myself. Well, slap me upside the head! The limestone arch here is gorgeous, and huge. 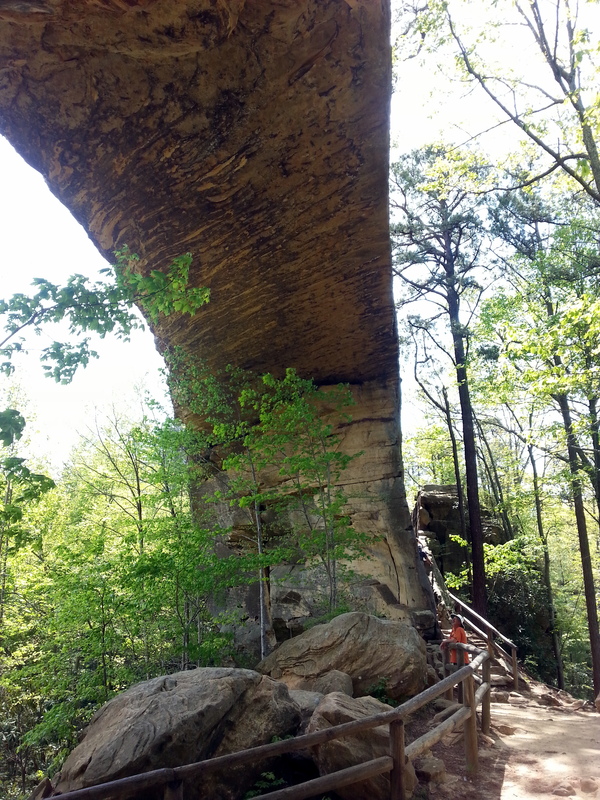 We hiked under, over, and around it, then away for a better view of the valley. 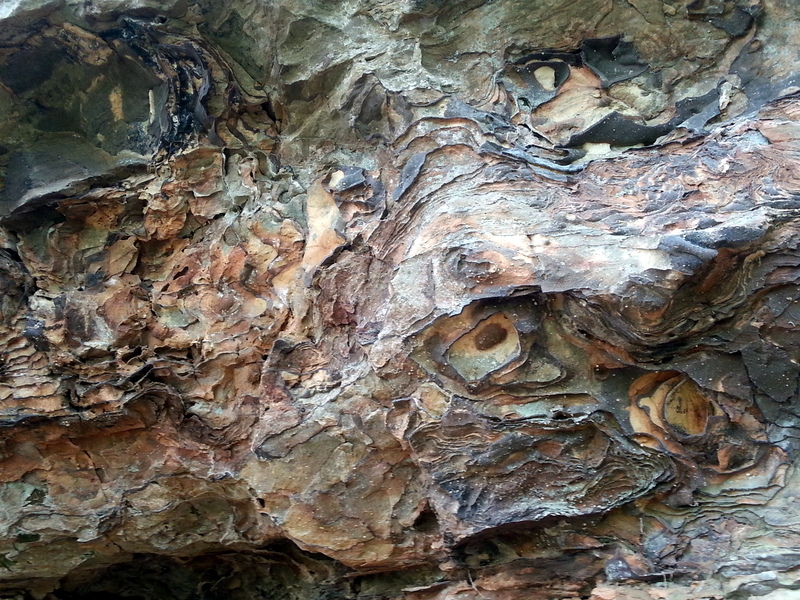 On the way down, we wandered down a trail called Rock Garden – huge mossy boulders beneath old hemlocks. The ferns, mosses and wildflowers were spectacular. 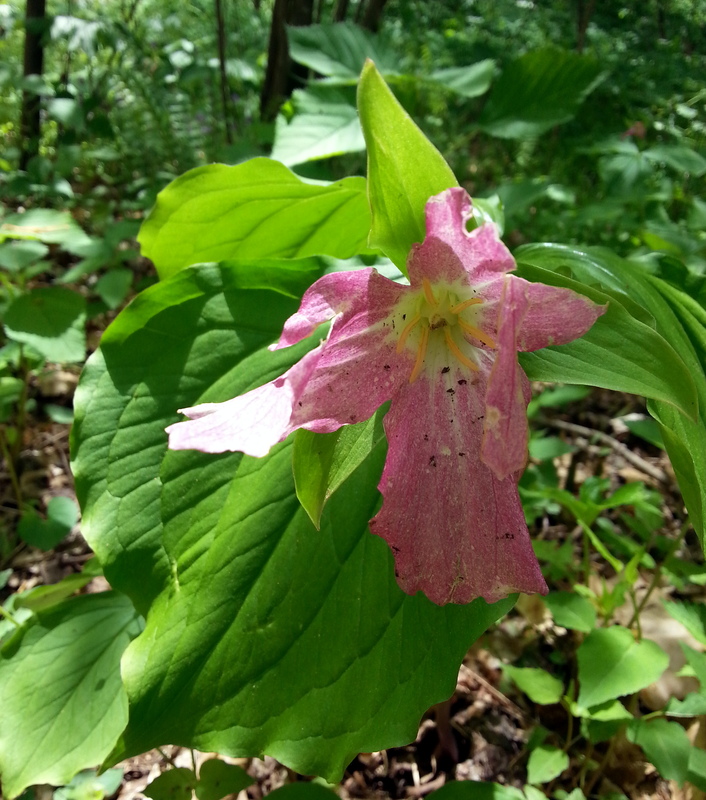 Saw my first pink trillium (didn’t even know they existed). 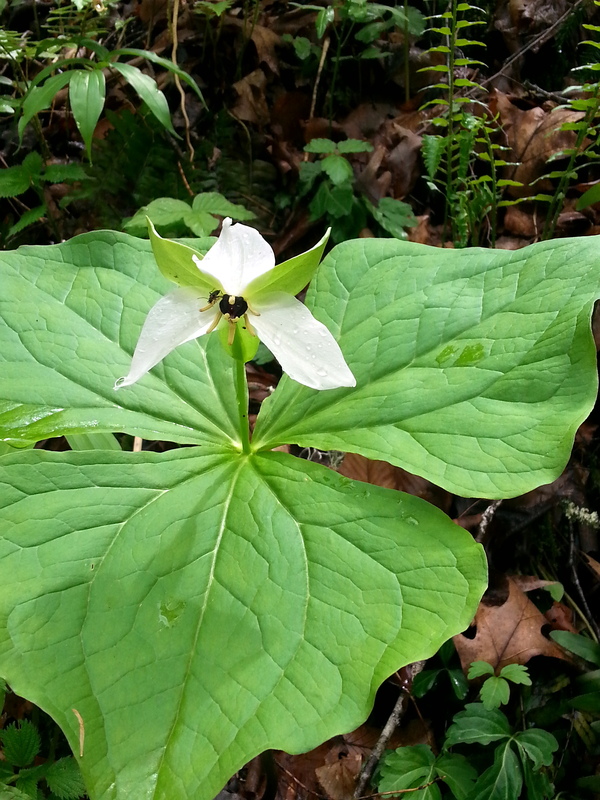 So, here’s a photo of another odd trillium I saw last week in Smoky Mountain NP. 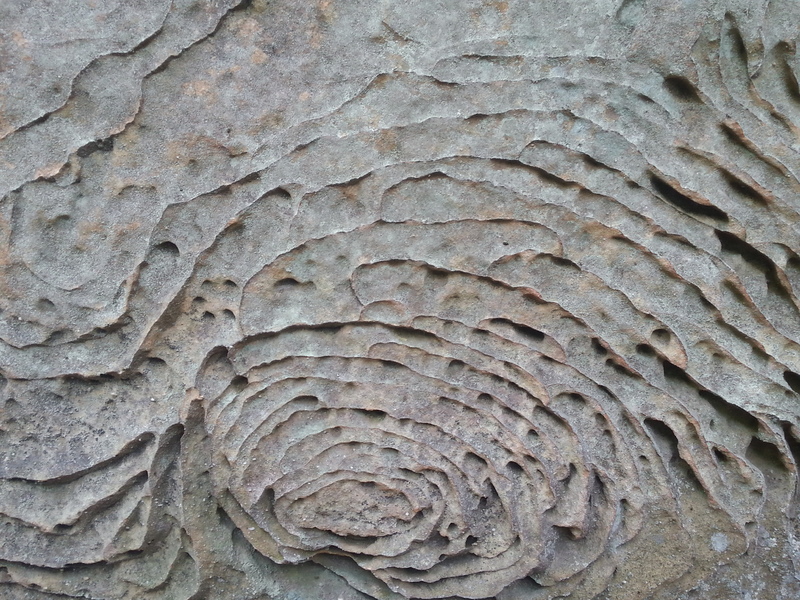 Water has made beautiful patterns on the limestone rocks. I’m anxious to do more strolling in the woods near home – most of the time my walks with Jezzy are pounding the neighborhood sidewalks or wandering through the nearby park, which is fairly open. It’s not often that we walk in deep woods, and it’s been a great experience. Moving on again today – crawling toward Michigan. This morning, as our fire alarm was blaring for no apparent reason (and John was outside with Jezzy), I thought that I’m not going to miss the camping life so much. I want/don’t want to go home. But, as I sit here looking out the window at the river and watching everything wake up with the low morning sun, I know that’s not true. John’s thumbing thru the atlas, and I know he’s already thinking about where he wants to wander next, too. Time to pack up and roll on. 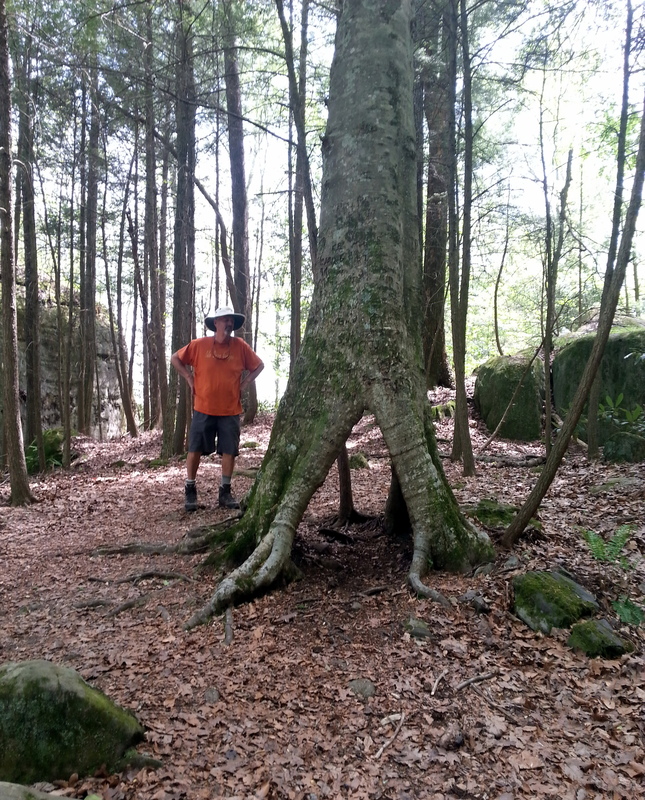 This entry was posted in camping, great outdoors, hiking, retirement, simple camping, state parks, T@DA and tagged camping, hiking, Kentucky, retirement, road trip, simple camping, state parks, T@DA, the great outdoors by Judy Crankshaw. Bookmark the permalink. What beautiful — and surprising — scenery! I kind of hate for your trip to end, too. It has been so enjoyable following you! Thanks for hanging with us all the way. Being home doesn’t seem as attractive, now that we’ve actually landed. Yikes! What a shack! I was quite surprised myself at my reaction. A day or two of work may help to turn that around. thanks again for your pictures stories. We had the first TT yesterday, mist you. See you next week at TT! We’ve had a great trip, but are happy to be heading home for awhile. The road home has it’s own attraction … I think they call it “barn fever”. One of the things we’ve discovered about travelling is the renewal of affection for our primary digs when we first settle back in, try out our nice leather recliners and fire up the big 60 inch and sleep in our old familiar beds. It’s always good to be home and we also get a renewed appreciation for the part of the country and neighborhood we live in. We live on a 39,000 acre lake surrounded by woods and many people consider this a vacation spot. It is strange however that the short passage of time continuously calls us like nomads to seek out new adventures and vistas. I’m anxious to reconnect with friends and family. Other than that, think I could live in the Fireball indefinitely. I really enjoy reading your updates and traveling vicariously with you, John and Jezzy. The photos and postings have been great and VERY entertaining, especially since I know I will never go camping!! (Hotels for me all the way–you guys are very adventurous and brave!) I hope to see you soon!! We hope to continue to be available for your entertainment again very soon! Here for you…..
I’m sure that you’re sorry that this trip is coming to an end, you’ve seen so much spectacular scenery, made many new friends, and visited so many places. But, I think that it would be nice to stretch out at home for a while before striking out again. 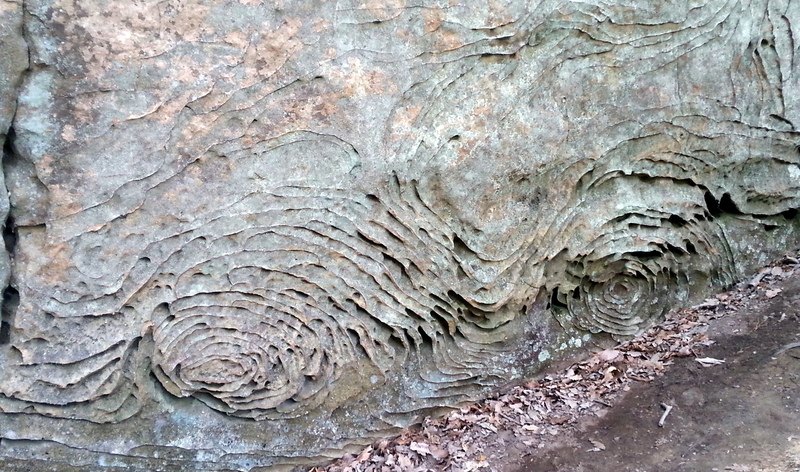 You should stop by at Miguel’s Pizza if you are still at Natural Bridge State Park. It is a climbers’ hang out. The pizza is great! The River Bank Run is on Saturday. Good luck Saturday. What’s your start time? If I can swing it, I’ll park myself roadside to cheer you on. Should be a bit easier for you than last year was. Hope so, anyway. See you next week, either way…. I have yellow, red, white, and pink trilliums in my native woods garden. They are all legal – bought them at WW Greenhouse in Hudsonville and a greenhouse somewhere on 4-Mile near Comstock Park. They’re so fragile looking. They fit in well with my May Apples, Lenten Rose, bloodroot, and Jack-in-the-pulpits. They’re a little hard to start, but they persist once they get going. They’re such a sweet welcome to Spring. I’m constantly amazed at the beauty, big and small, you are sharing with us, I’ll be glad to see you when you get back, but I’ll miss your travelogue. Enjoy every moment. Guess I’ve only seen them in the wild, and never pink. Happy/sad to be nearing home. Your journey this year has been great – thank you for all the postings !!! Thanks for reading, and I always love the comments. Like having a bunch of pen pals! See you next week – can’t stay away from the bookstore too long, once I get home.